This home-made ice cream - that's strictly for adults thanks to a splash of almond liqueur - is surprisingly easy to make as it uses ready-made, creamy vanilla custard. Roughly chop the peaches. Heat the orange juice and sugar in a saucepan until the sugar dissolves. Add the peaches and simmer gently for about 5 minutes until very tender. Leave to cool. Transfer the peaches and juices to a food processor or blender and use the pulse setting to blend to a very chunky pulp. Tip into a bowl and stir in the custard and liqueur. To freeze by hand, pour the mixture into a freezerproof container. Freeze for 2½-3 hours or until frozen around the edges but still loose in the centre. Turn into a large bowl and beat with an electric whisk until the consistency is even throughout. Return to the container and re-freeze for about 2 hours until half-frozen. Re-whisk and freeze again. Repeat this process once or twice more until the ice cream is smooth and creamy. Each time you return it to the freezer it will freeze more quickly. Freeze until firm. Serve in cones or scooped into small bowls or glasses. Put the ice cream in the fridge for half an hour to an hour before serving to allow it to soften slightly. For a low-fat alternative, swap the Waitrose Fresh Vanilla Custard for Waitrose Perfectly Balanced Custard. 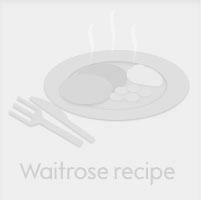 This recipe was first published in Sat Jul 01 01:00:00 BST 2006.